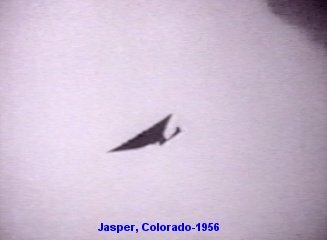 The UFO in the photo to the left was seized by the U. S. government in the Boumount Ridge section of Jasper, Colorado, in the summer of 1956. The government moved the flying saucer to a remote area called Wild Fork, where they ran tests on it, eventually figuring out how to fly this spaceship. The above photo was taken by a government official during one of the many test flights. At sunset on July 17, 1956, Miles Oman, a farmer in Jasper, Colorado, was getting ready to call it a day. He was walking back to his house when this strange, oval-shaped object in the sky caught his eye. It looked like a spaceship. The object zipped across the sky and was gone. This sighting kicked off one of the most amazing UFO incidents in the history of the world. For approximately two months, the town of Jasper and the surrounding areas experienced one unusual event after another. Scientists rushed in to investigate, reporters rushed in looking for stories, and government officials rushed in to keep it a secret from the world.